Here we have an Audio Bible that is a solar powered digital player that can be charged by sunlight. 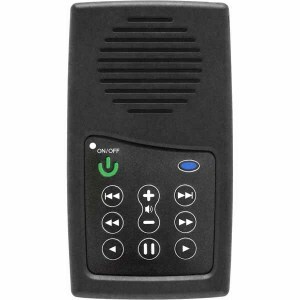 The MegaVoice Envoy S Audio Bible is small, sturdy, innovative, and ultimately portable. It is lightweight and it is a powerful teaching and training tool, at only 2.4 ounces, for learning the Bible. This is also a wonderful way to listen to the bible and favorite passages of the Bible in a small and compact pocket size unit. It has raised buttons and four levels of navigation which make it incredibly user friendly for searching through hundreds of hours of audio Bible content. We would recommend this as an excellent portable audio Bible for the Visually Impaired, Blind, Children, Adults, and Senior Citizens. This Megavoice Envoy S King James Version has up to 800 hours of tamper-proof audio content which eliminates any chance of erasing or recording over this searchable Bible. This audio Bible is also equipped with the MegaVoice Smart Loading System which can be used with its included USB port to simply and securely allow your ministry to update content, if needed. Provided in a nice light gray tin case with a window. * Available in the New International Version or the New King James Version, please specify.